So Becky is turning 12, which means it’s time to plan to plan an fun, safe, yet exciting event. What does it mean? What do 12 year olds enjoy beside spending the first month of 2019 helping an egg break a world record? (see the egg on instagram). Here are 10 amazing birthday ideas for Becky and her friends. Of course we’re going to include the classic. Maybe you had your own 12th birthday there. They have games and food and prizes and pretty much everything a kid wants in life. They also do a great job making birthdays into special occasions, with balloons and private rooms for cake. The bay area location is technically in Daly City, not SF, but I mean when it comes to fun and games, Dave & Buster’s knows what they’re doing. Maybe your kiddo likes to unleash their creative side. Maybe you just want to splatter paint another mug to go with the one you made at your niece’s birthday. Whatever the reason may be, there’s something so fun yet calming about painting pottery. Some children will shock you with their talent and some will take home ceramic cats covered entirely with red paint. No matter what they do, they’ll have fun hanging out and making something that they get to keep forever. Most of the places on this list also have back rooms for private groups so you can get your cake and pizza on, too! iFly is crazy cool. You are basically skydiving indoors but with none of that danger and heights stuff, because you’re a responsible parent. This idea is probably best for smaller groups; iFly has groups of 1-2 people flying at a time while the rest of the group watches. The children will get a kick out of the GoPro style cameras they have (if you don’t gram your party did it even happen!?) and you’ll have a blast experiencing sky diving from the safety of an indoor building. Take ‘em out to the balllllgame!!! Take ‘em out to the crowds!!! Buy them some peanuts and crackerjacks. Who cares if they’ll have a crazy sugar rush? But for real, baseball is fun, and the Giants have a beautiful stadium. There are many large groups of tickets seated together throughout the stadium, so any party large or small can have a…(wait for it)…ball! What if I told you there was a way to spend all of their energy and have an absolute blast?! House of Air has more trampolines than you could possibly jump on in one afternoon and they have staff members to guide games and group activities. They also have private rooms for cake and other birthday games. An escape room is a fun way to not only entertain your kids but also encourage teamwork. Reason has virtual reality, drones, and all sorts of fun tech toys for kids to experience as they work against the clock to escape the room. There are two different rooms that can accommodate groups big and small depending on your party. they have an event space with VR headsets to celebrate with lots of cake and candles. Perry Yan is a rock star magician and balloon twister here to entertain kids and adults alike. Imagine how excited each child will become once they are outfitted with 3 foot tall balloon hat and watches watching a magician pull a bunny from a hat. Perry is also an all star entertainer and will keep your kids engaged for the whole party — just in time for cake, candles, and more balloons of course. Perry has been written about in many bay area publications, too! The Exploratorium is essentially a San Francisco institution for all things learning, entertaining, and well…exploring. 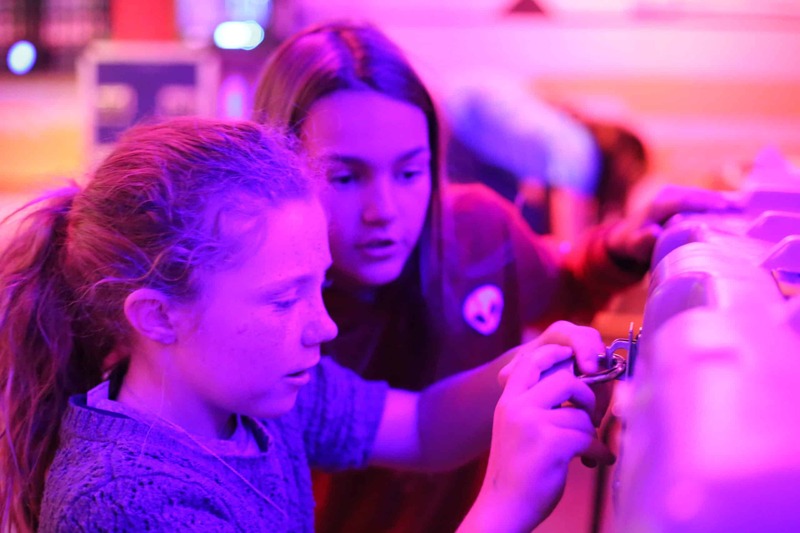 From quiet outing to energetic birthday parties, the exploratorium really has something for everyone. Bring the children and unleash them while you stroll through the exhibits that pique your interest; then ask about reserving a table in the side yard for cake! All these animal gifs have been leading up to this suggestion: a petting zoo!! Who doesn’t want to hang out with some cute animals and play with them for an afternoon. Make your kiddo the bell of the ball by bringing the petting zoo to you! Then have snacks and cake as you please. They bring all of the animals right to you and before you know it you’ll basically have your own farm in SF (without the clean up or actually feeding the animals, of course). This takes duck-duck-goose to a whole new level. Many children love to climb, but we usually tell them not to. But why is that? For this special occasion, unlock their deepest inner climbing desires and plan a trip to Planet Granite. They teach the little ones ropes skills while giving everyone a chance to reach for the heights in a safe and controlled environment. So there you have it, folks. The 10 best ideas for your little Becky to show her friends that no one parties better than her. Happiest of birthdays to your kiddo and here’s hoping you can find a birthday party that’s fun and engaging for you both!! And of course that Susiecakes can make your last minute custom order in time.